And another year has got away from me, with far too few blog posts. As usual. It’s been a bitty sort of year. My health hasn’t been all it should be, recent changes at work have put me under more stress than I really like to cope with, and I haven’t been as creative as I would like to be, either. Still, there have been Good Bits. Since my last post, my friend KRin from Australia arrived for a short visit, giving me a chance to be a local tourist guide for a day and also an excuse for a train trip with her as far as Machynlleth the next day, where she headed north along the coast to her next destination, and I went on to Aberystwyth in lovely weather. 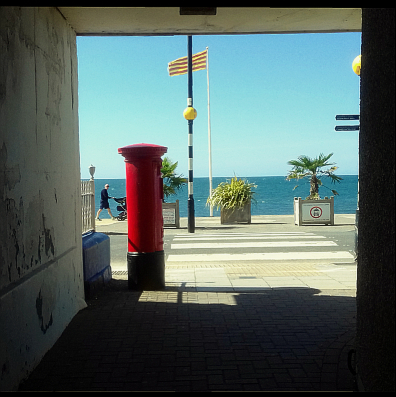 Here’s Aber looking almost exotic in the autumn sunshine. At the end of the month, I met up with Rachel of VirtuoSew Adventures, to see her work on show in an exhibition at the Anglican Cathedral – and to talk rather a lot, of course. In November I went to MathsJam The Gathering at Yarnfield Park near Stoke. This is run by Colin Wright, Rachel’s husband, and she talked me into coming along. I had little idea what to expect, and I have never been a whizz at maths. I didn’t really know what to expect…. It was a lot of fun! The conference centre is a training centre for telephone workers in the week, and the first thing I saw on entering the car park was a forest of telephone poles in an enclosure. Fortunately we were not expected to climb them ourselves. The accommodation and food were excellent, and the conference areas were good, with plenty of space to sit and talk or chill out, away from the main room, tea and coffee on tap and friendly staff. The event itself turned out to be lots of very short talks about a huge range of subjects – mostly recreational-mathematical, but ranging from the topology of canal bridges to card tricks to recreating old photographs to double-sided blackwork embroidery patterns – and much else in between. I think I made good sense of about a third of the talks, was totally bemused by a further third, and got the main gist of the rest. There were puzzles to play with, a baking contest, competitions and maths tricks to look at. I think the people with the tricks were very happy to have a non-mathematician to baffle. And there was conversation, lots of it. I came home hoarse but happy. I might well go again next year. While I was at MathsJam, I got quite a bit of stitching done: the card design that is at the top of this page. It’s on 32 count linen, worked with Gütermann Sulky Cotton 12, mostly in straight stitches over 4 threads. 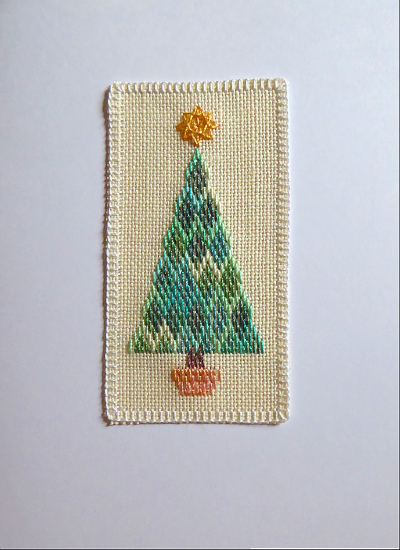 The star at the top of the tree is 8-point woven star stitch over an eyelet of straight stitches. 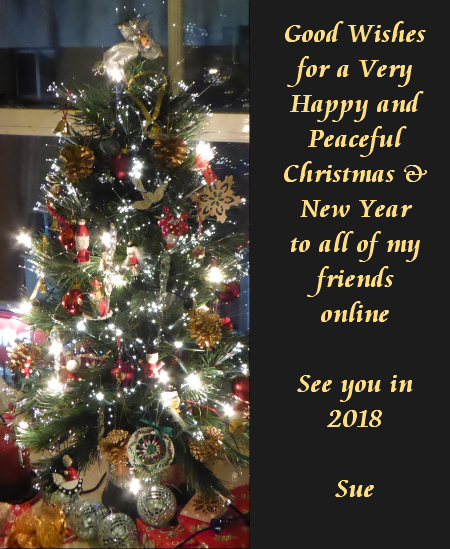 It comes with my very good wishes to all my readers (who have been very patient between blog posts!) for the festive season, and for 2019. I do like making bookmarks. They are small enough not to take too long, big enough to be satisfying, and very suitable as carry-around projects. They are also great for just doodling with stitches. This one is on 14 count Aida fabric in cross stitch and slanting Slav, with a buttonhole stitch edging. I made it up entirely as I went along, starting with the edging, then positioning my main shapes and finally filling in the smaller shapes and the background grid of cross stitches. 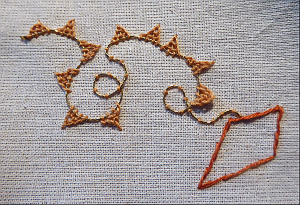 That’s a very relaxing way to stitch – no pattern to follow, no pressure. Just do it! 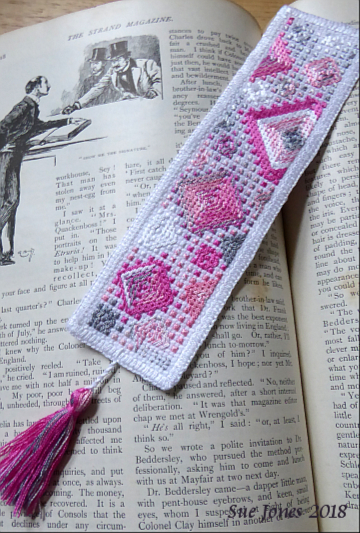 This bookmark was worked with two strands of a fine spun-rayon thread, in white, deep pink and a variegated pink/grey. But it could just as easily have used stranded cotton, silk, or anything that would make a plump cross stitch on this fabric. Aida is a very ugly fabric, so I made sure I didn’t leave any holes completely unstitched, even though there is quite a lot of ground showing between the spaced crosses. That allowed me to take advantage of Aida’s sturdiness and ease of use, while avoiding its harsh, mechanical look. I used cotton thread for the cord that holds the tassel, for strength. The back was not perfectly neat, as I wasn’t planning ahead, so I backed it with some lightweight iron-on interfacing. I stitched it down around the inside of the buttonhole edging so it won’t pull away if the glue loses its grip over time. Another good thing about bookmarks is that they only take a little fabric, thread and time. If they go completely wrong you haven’t lost much and you may well have learnt something useful. You can afford to experiment and try out ideas. I wasn’t expecting this one to ‘work’ – but I’m very pleased with it. So what has happened since my last post in March. I went to the annual Sewing for Pleasure event at the NEC in Birmingham in March was well worth visiting, and an excuse to meet up with Rachel of Virtuosew Adventures. We enjoyed looking at the trade stands and the exhibits. Perhaps nothing as impressive as last year’s court costumes, but there were some fine old kimonos on show, and a display of embroidered panels that were a collaboration between European textile artists and Afghani embroiderers. Both of these displays were worth seeing – as was Rachel’s crochet bag on its first outing. 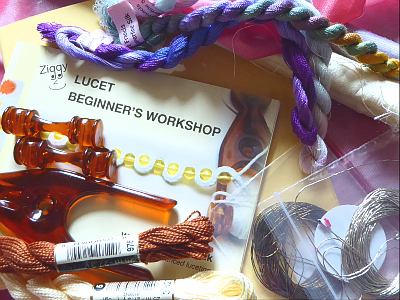 The strange brown plastic thing is a lucet – an impulse purchase thanks to a very persuasive ‘luceteer’, Ziggy. My own attempts at making cord have not been very successful yet, and I suspect that this gadget will end up in the back of a drawer. I don’t seem to have the knack. 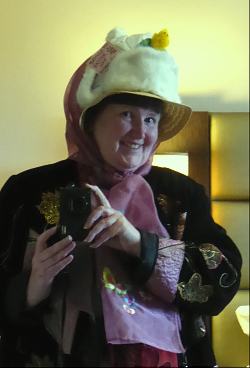 Easter was spent at the British National Science Fiction Convention, Follycon, in Harrogate. Appalling weather, endless rain, cold winds and even some snow, but I had a fine time. Some good talks, including Kim Stanley Robinson on Galileo and Nick Jackson on some female mathematicians. And we had an Easter bonnet parade at a splendid Mad Hatter’s Tea Party. A fairly successful art show for me, and my stitching workshop on ‘Darned Planets’ went surprisingly well. A dozen people learnt how to do some simple pattern darning to create a textured area on a card (one of my samples is at the start of this post), and I learnt how few people know how to thread a needle easily. (I could do a post on that if anyone is interested.) Here’s the group busy making their planets, in an unsettlingly-mirrored room in the Majestic Hotel. 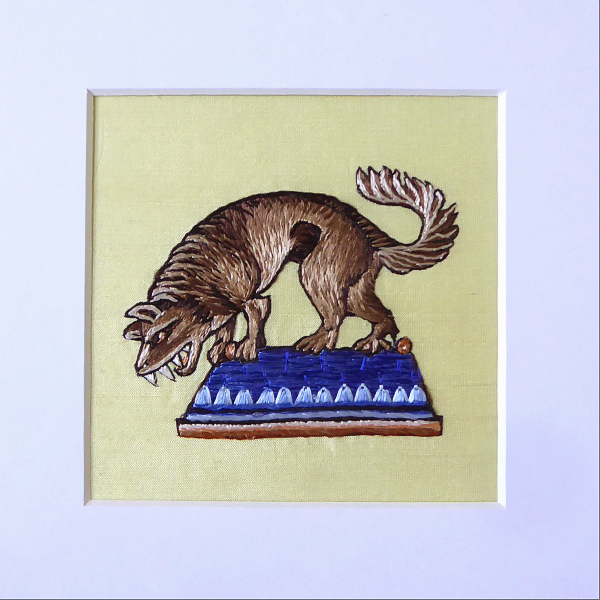 Sometime last year, I was looking at some illuminated manuscript illustrations online, and found one that I very much want to do as a piece of embroidery. It’s from the Aberdeen Bestiary and is the illustration to The Wolf. The photo on Wikipedia is HERE. It’s going to be a long-term project, preceded by several practice pieces. The first one is just the small wolf standing on the sheepfold roof. I started it before Easter but struggled with it. I could not get the shading on the wolf to look right. In the end, after a lot of unpicking, I left it for a month and came back to it fresh. This time it went much better. I was happy. Until I took it off the hoop, that is. I used lemon-cream coloured silk dupion for the base fabric, tacked over Egyptian-cotton sheeting – the double layer was very easy to stitch through. 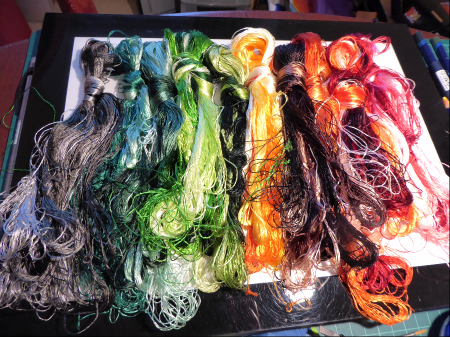 The thread is all silk – a mixture of Chinese silk and Devere Yarns 06 silk. Despite having a heavy build-up of silk thread in the shaded areas, it had stayed very flat in the hoop. No puckering. I was very pleased. But as soon as I got the damp cloth and warm iron on it, ready to mount it – disaster. Between the legs, under the tail and head and below the roof – horrible puckers in the unstitched silk fabric. Pinning it out damp did not solve the problem. I was nearly in tears by this time. The next day I very slowly and carefully cut away the cotton backing outside the stitching area. (Trying to separate the layers between the legs was fraught, but I did manage to get my scissor-points through the cotton without damaging the silk – eventually.) Then I blocked the silk and got rid of most of the puckers. A second firm pinning out, pulled tight over the foamcore mount board, and it looks okay. Well, okay-ish. (I resorted to gluing the fabric down on the back of the board before removing the pins, just to be extra sure it woud stay put.) I am very glad that this was only a sample, not the whole piece. I guess I’ve learnt a lot in the process! Now I am looking forward to starting a new small project. I think it will be counted thread for a change, before I go back to another silk piece. I found some light grey 32 count Zweigart linen in a charity shop last month, and it keeps waving at me and asking to be used. I shall consult my books and resources and ponder…. One final thing: the WordPress stats tell me that I get a lot of visitors to this site, but very few visitors leave comments or ask questions. I do like to get some feedback on my blog posts. Otherwise it feels like I am just talking to myself and the one or two (very welcome) regular comment writers, and I get discouraged. 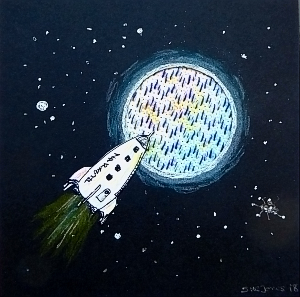 And, as always, if there is something you would like me to write about – embroidery techniques in particular – let me know and I’ll see what I can do. 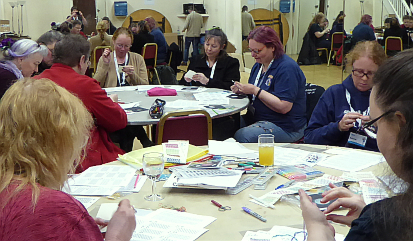 Hanny Newton (standing on left) and about two thirds of our workshop group busy with their stitching. 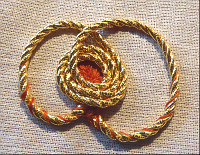 I have just spent the day at an excellent goldwork workshop, here in Shrewsbury. Hanny Newton is RSN trained. She produces beautiful work: combining technical excellence with fascinating simple design. Have a look on her website – although photography never does goldwork full justice. She’s a very good tutor: inspiring learning by experiment, rather than pedantic coursework, but able to give lots of tips and pointers. I have never had a great urge to get into goldwork as such – although it is hard not to be a little tempted after today’s workshop. However, this day was focussed on couching, and knew I did need help with that! I’ve let myself down with bad couching when I have wanted to edge silkwork with metal thread (an effect I really love), so I went hoping for help and tips. I wasn’t disappointed. I have come home with lots of good advice about the thread to use (fine passing) and how to get it to sit neatly in place – and to stay there. We were in a beautifully light room, in the barrel-vaulted attic of a medieval mansion house, part of Shrewsbury Museum and Art Gallery. We were one storey above the Corbett Bed, and I think that some benign influence from that feast of stitching percolated up to inspire us. It was a relaxed and friendly day, everyone enjoyed it and learnt from it. My humble efforts are hardly worth showing here, but I was there to learn, and I hope that I can practice and do better. You can see rather wobbly lines of couching, some playing about with buttonhole stitch as a couching technique (one of the triangles is detached buttonhole stitch) and an attempt to couch down a big twisted cord, going from very visible stitches to hidden stitches. That one was not much of a success (I was getting tired by then), but all the experimenting was valuable. 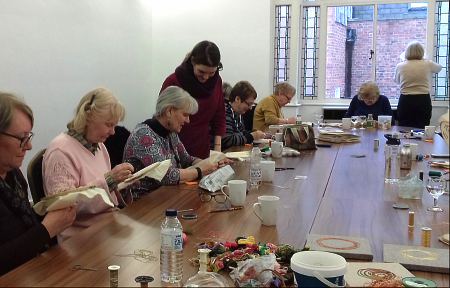 Thanks to Hanny for an excellent day’s stitching, and to Shrewsbury Museum and Art Gallery for setting it up for us and providing refreshments. More please! On Friday I am off to Sewing For Pleasure at the NEC in Birmingham. I will be touring the embroidery supplies stands looking for fine passing thread! Normal service will be resumed soon, I promise. Meanwhile, here is the tree on my windowsill. Thank you for your comments and emails during the year – they make the blog worth doing. As regular readers will know… (Hello, Regular Readers of Tortoise Loft – The Blog. Thanks for sticking around!) My usual go-to silk thread is DeVere Yarns lovely 06 silk. Fine, smooth, filament silk with a very slight single twist to make it manageable. It comes on neat cardboard bobbins and in a good (and slowly increasing) range of colours. I can highly recommend it.